Friday the 21st of September 2018 The BT13 – Give Up The Ghost opened at Kim? Contemporary Art Centre in Riga. The opening consisted of a wide range of different performances throughout the evening. 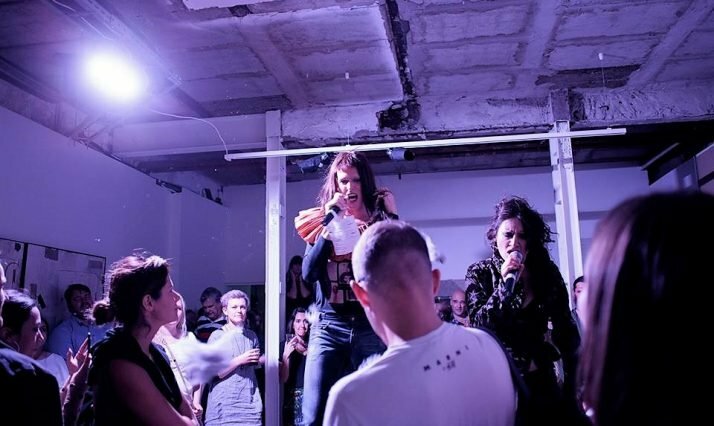 One of the opening acts was made by Danish-British Adam Christensen and Keira Fox, who throughout their performance inhabited and used the exhibition space done by Ben Burgis and Ksenia Pedan. This exhibition plays out through the majority of Kim? with equal parts of installation and sculptural works and was used directly by the performing artists who responded to the space. The wild and captivating performance gave the audience an interesting experience, shaped through the booming music and the mesmerizing presence of Fox and Christensen. The performance was supported by the Danish Cultural Institute in Estonia, Latvia and Lithuania. The Triennale exhibition in Riga will be open until the 11th of November 2018 at Kim? Contemporary Art Centre.